The UlvaVac is a very easy spraying tool to use, simple to mix vaccination and easy to read units on the side of the 1 litre container. 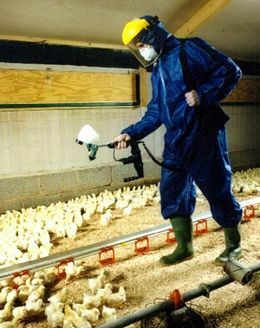 With the modern broiler, bird vaccination is key to performance, so this is where the Micron sprayer comes into its own. Due to the 3 metre spraying length it ensures a quick and stress free application for the birds. Bio-security is a vital aspect on my farm so keeping machine and equipment clean is paramount. The UlvaVac is user friendly as most of the sprayer can be dismantled for easy cleaning. 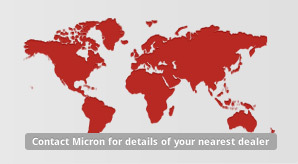 The best features of the Micron sprayer is the battery life, minimum time taken to charge the battery, a shoulder strap for transportation of the light battery and noise level when spraying is kept to a minimum. I would, without any doubt, highly recommend the Micron sprayer due to its fantastic value for money and brilliant usability. 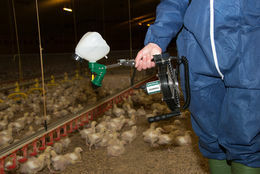 The UlvaVac is a professional spray applicator for poultry vaccination. 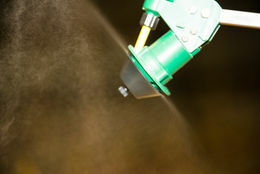 The sprayer incorporates a spinning disc atomiser to control accurately spray droplet size, a process referred to as Controlled Droplet Application (CDA) which is essential for the efficient delivery of spray vaccine. Spray droplets are dispersed in a turbulent airstream to ensure even distribution to all birds. The sprayer consists of a one litre spray reservoir, colour coded liquid feed nozzles to control flow rate, atomiser spray head with spinning disc, electrically operated fan to disperse spray and 12V battery for power with recharging unit. The UlvaVac can be used for vaccination of broilers, layers and turkeys and is recommended for vaccination against respiratory diseases such as Infectious Bronchitis, Turkey Rhinotracheitis and Newcastle Disease. 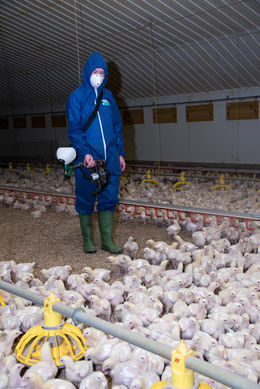 Low spray volumes of 1-2 litres per house are normally applied allowing operators to treat up to 30,000 broilers, for example, in less than 20 minutes. The method of atomisation used by the UlvaVac gives precise control over droplet size, ensuring accurate delivery of vaccine to the eye and upper respiratory tract. Post-vaccinal reaction caused by the production of very small droplets is minimised. The precise control over droplet size also allows the use of low spray volumes which significantly reduces the time spent for both vaccine preparation and application, ensuring minimal disturbance to birds.